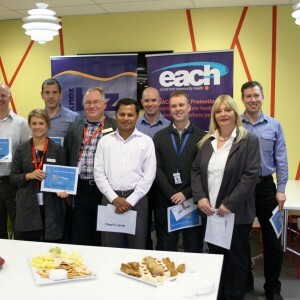 Local Bayswater workplace Emerson Process Management was this week awarded with a pop-up breakfast and congratulatory awards by Knox Council for winning both the workplace ‘team’ and ‘individual’ categories of the recent cross-workplace 10,000 steps challenge. The winning Emerson team managed to complete 5,439,285 steps in the 28 days – nearly the equivalent of walking from Perth to Canberra! In total, 22 local workplace teams from businesses, schools and early years services competed in the workplace walking challenge, with Emerson Process Management winning both first and second place for most steps taken in the ‘team’ section. Staff at Emerson are largely office-based across, and face health issues related to prolonged sitting. To overcome this issue, the workplace has implemented multiple strategies including: standing desks, within-workplace walking and table tennis challenges, health related education sessions, a scheme for discounted private health insurance and subsidized seated-massages, to promote staff health and wellbeing. More broadly, the workplace is focused on environmental management, community support and community engagement through its social responsibility program. Knox Council Mayor, Cr Darren Pearce, said the 10,000 Steps Challenge is a great way of encouraging people to be physically active in the workplace. “Council is proud to support local businesses in their efforts to encourage greater physical activity and congratulate Emerson upon their success,” said Mayor Pearce. 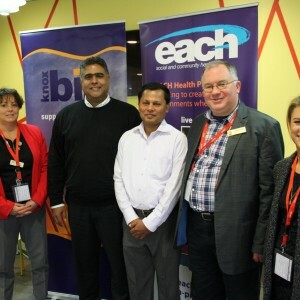 “It is encouraging to see local workplaces like Emerson Process Management engaged and committed to supporting staff health and wellbeing at both the individual and structural level. A sustained commitment to all aspects of employee wellbeing makes good business sense, and is attractive to future business and employees”, said Emily Groszek, Workplace Health Promotion Officer and 10,000 steps coordinator from EACH. “Congratulations to Emerson Process Management and staff for its health promoting efforts, and we hope to continue supporting Emerson with ongoing health and wellbeing initiatives”. The 10,000 steps challenge took place over April and May 2017, and was led by EACH and supported by Knox City Council. For more information on the program or how your workplace can improve the health and wellbeing of staff and management, please contact Emily Groszek, Workplace Health Promotion Officer via emily.groszek@each.com.au or call 9757 6250.